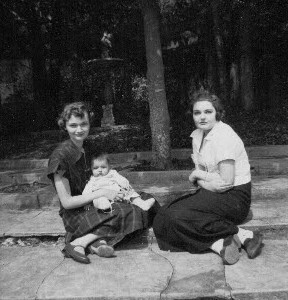 My mom holding me as an infant, and Aunt Lilybet. Yesterday, my mother died at the age of eighty-three. I suppose I should have expected this. One of my sisters asked me today why we didn’t let her die at home. The truth is that I either didn’t realize that she was dying, or in denial about it. She took a shower alone the day before, had been bathing and cooking for my mentally retarded sister in the prior weeks. There was no change in her routine except for the tendency to fall asleep in the middle of a conversation (I attributed that to us boring her). Last weekend the struggle to eat and drink seemed to have escalated. My sister became a short-order cook. I tried shoveling food into my mother’s mouth, but she wouldn’t allow it. We hounded her all weekend about eating and drinking. By Sunday night, I was starting to worry. She was sleeping a lot, but still lucid with periods where she seemed a little confused. I had threatened her with the Emergency Room for an IV if she didn’t drink, and she tried. Finally, I realized that she was unable to get more than a sip or two down. Monday morning I asked Liz if I could make the call and she agreed. Five men in three ambulances came in to my mother’s antique filled house, and with gentleness and respect, took her to the hospital. It was surreal. My mother has been a pillar of strength to me. To see her frail frame on the stretcher in the Emergency Room was a baffling and soulful experience. How did this happen? When did she get old? She did her own taxes up until last year. My mother could discuss politics with the best of them; she was a liberal who was looking at conservative candidates for the next election. She was interested in everything and everyone. She still enjoyed going to a good garage sale with my sister more than anything. And now, this. I had to leave the room for a few moments to compose myself. Seeing her laying there confirmed something to me; everything I had argued with my mother about was of no importance. All the horrible things I have said to her over the years, first as a rebellious teenager and then sadly, a disrespectful adult, now haunted me. I had to hurry; I had to apologize to her before it was too late. She was starting to drift in and out of consciousness, but during a lucid period, I could say to her how sorry I was that I had spoken without really understanding what I was saying, that if I could take back anything hurtful over the years, I would do it right then. And so like my mother, she said ‘don’t be silly. There is nothing to feel badly about at all. Nothing at all.’ And then she slipped into a sleep that would only be disturbed one more time, and that was when her baby sister, now eighty, and my sister Liz, her lifetime companion and best friend, came to see her in the evening. She woke up and acknowledged them, thrilled to see her sister after a long absence. After they left, she did say to me, ‘I am surrounded by beautiful women.’ And that was that. She never regained consciousness. I am so sad. There is no one else who will always be happy to hear from me. I could call her at any time of the day or night. My mother was my champion, no matter what I wanted to do. My mother wasn’t perfect, but she was wonderful. Many, many things have happened in the past twenty-four hours where my first impulse was to say, ‘I need to call my mother and tell her about this.’ And I can’t. I love you, Mom. I miss you so much already. Oh, I hope heaven really exists and that you are up there with Dad. I can’t wait to see you again. This entry was posted in Life and tagged bereavment, children, death and dying, heaven, motherhood, old age, parental love, peace, regrets, siblings by Suzanne Jenkins. Bookmark the permalink. Reblogged this on 2sheepinthecity's Blog. What a lovely tribute to your mother and your loving relationship. It is true that we don’t realize sometimes that we will miss an unconditional support when we lose a close loved one. We know we will miss them, but you are so right that we lose the champion for everything we do. It’s a selfish feeling in many ways, but it’s such a powerful and monumental loss that it’s a wonder all of us keep on going without it. And to think that some people never have that kind of person in their lives – ever! It must make us grateful that we ever did…. I am so sorry to hear of your mother’s passing. I only knew her through you but the love and respect you had for her shown through every time you talked about her. What a lovely tribute to her– not just this post, but the way you live your life. My dear cousin and childhood playmate, I am crying tears of both sadness and joy after reading this tribute to your beloved mother Evelyn. You have so beautifully expressed the relationship between mother and daughter, my own included. We are all truly fortunate to be surrounded by beautiful women, and you are one of the most beautiful. I’m so glad to have you back in my life! Beautiful words, Suzie. The pain that death brings is like no other. Your Mother did a beautiful job during her path of life right to the end. Your words are a tribute and to many of us a reminder of what we felt when we lost our mother. Thank you. Suzie, I am so sorry for your loss. Thank you for sharing about your mother–you have written so beautifully about what we go through when someone passes. It has been 23 years since my Mom crossed over and I miss her still, although the pain has passed. I will keep you in my prayers, dear. A mother’s love is eternal. Hold on to the loving memories. God bless. Beautiful and respectful! Your mother would be proud. Dear Suzie, I am sorry for your loss: My Loss! I have been sad, numb and in disbelief. Thank you for sharing your prayer. It is very respectful and beautiful. I love you! It dislodged some of my stuck feelings and I wept. I understand your impulse to call and tell her about this. Maybe the expectation that someone we love will always be there comes from our spirit. The truth, for me, is that the dead are still accessible. Instead of a phone, or face to face, conversation an alternative communication is possible for you at some point. Experiencing our own quiet presence one may enjoy in any circumstance; Where, like Evelyn, one is committed to the moment and accepting things as they are. Its at these times when we are open to hearing their gentle whisper. I read something that really resonates true: We are infinate energy having a human experience. My tears are flowing for you and my heart is breaking for you. Cousin your writing is both powerful, yet humble. It was amazing to read and is such a fine tribute to your mother as it says quite a bit about the fine daughter she raised. I am so sorry. I know how difficult this is. One of my favorite quotes is “I can’t imagine existing in a world where my dad doesn’t.” No matter how sick someone is or isn’t, we are never prepared. You will be in my thoughts and prayers through this very difficult time. So eloquently written. Thank you for sharing your thoughts.